This site is located about 13 miles north of Fort Clarke in Kinney County. 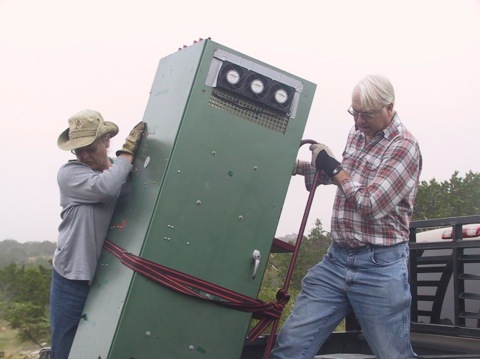 A 180 foot tower supports a Super Station Master repeater antenna. 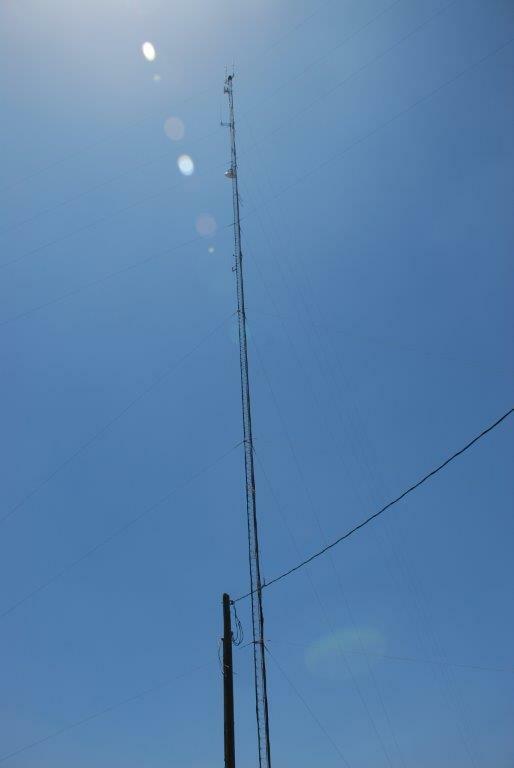 Radio coverage extends from the outskirts of Uvalde along U. S. 90 to the far side of Lake Amistad. Brackettville links Uvalde to Pandale. This station has seen several rebuilds over more than 25 years' service. We have arranged for tower painting and have replaced the roof. We share the site with Texas Parks and Wildlife. Coverage extends to Eagle Pass in Maverick County. 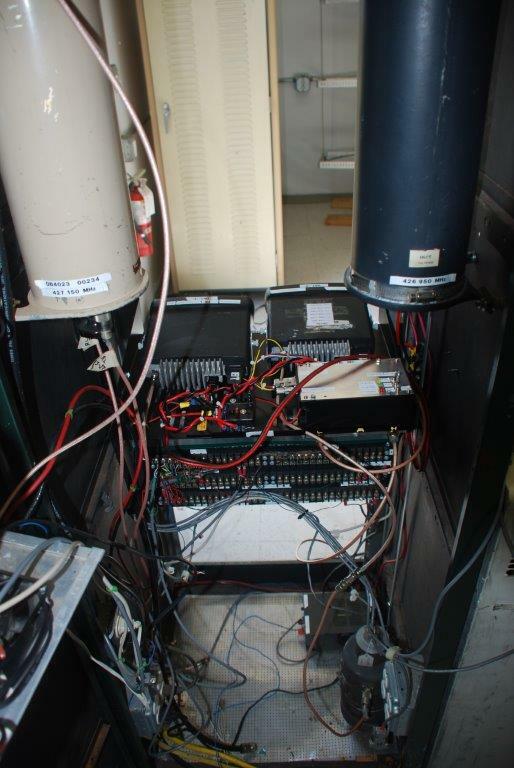 Top of Palomar controller with adjacent EMR Intermod panel (1 of 3) - notice careful performance measurements logged by Dink, WA5LNL, prior to bolt-in. 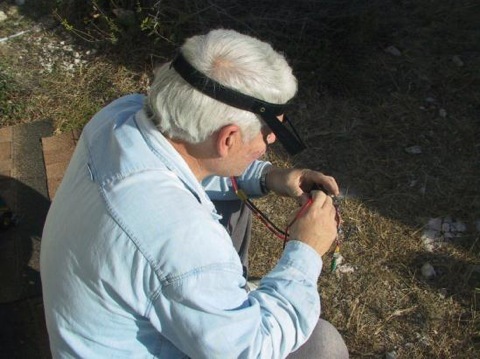 Dink tuned all 3 link duplexers at his bench in San Antonio and tested each link radio assembly, prior to hauling to Brackettville. The rear of the station shows 2 large band pass filter cavities. A 3rd filter sits on the bottom in the shadows. 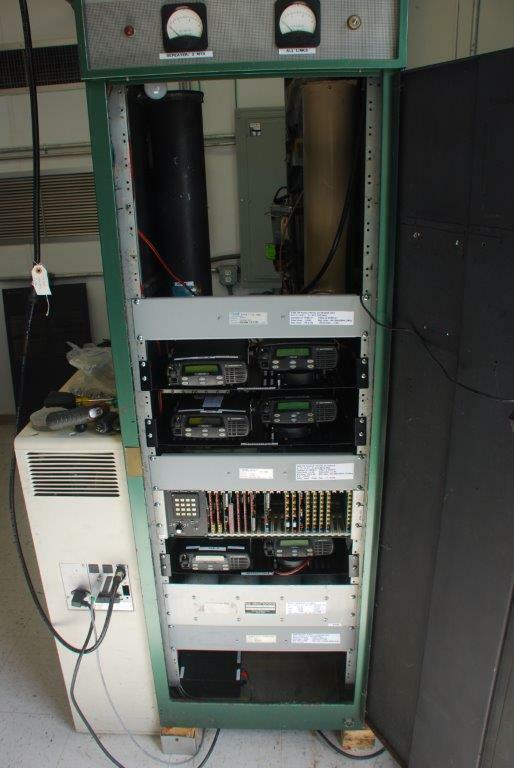 With circulators on repeater and all 3 links, combined with the band pass filtering, QRM should be controllable. 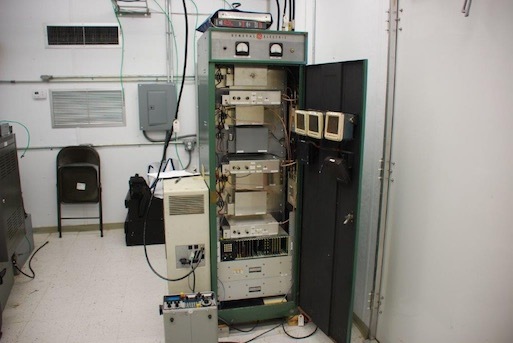 The attractive front panels and radio trays fit nicely into the ancient GE "Pre-Prog" cabinet - sole reminder of our beginnings in linked radio. The test setup is shown. 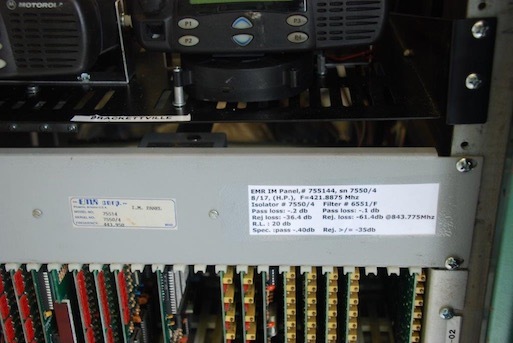 Two service monitors are required to adjust the audio levels in the Palomar controller. 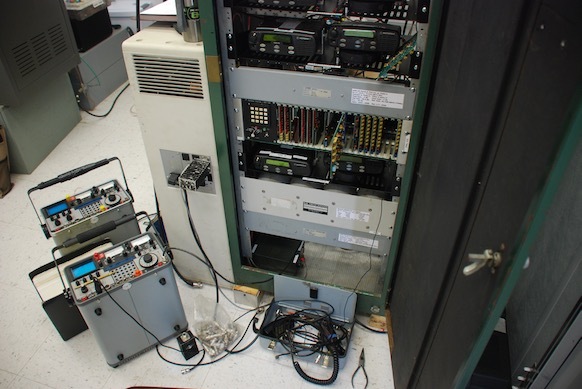 The smaller radio box to the left houses the Motorola MSF-5000 85 watt repeater. 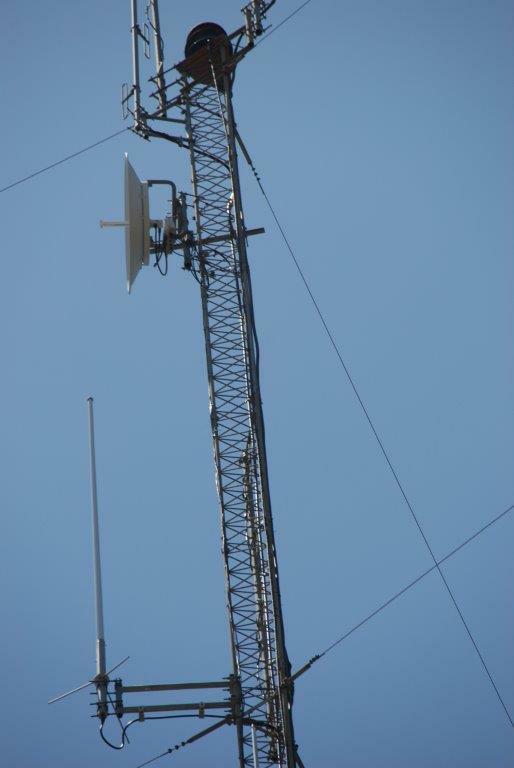 These pictures show Brackettville prior to installation of the new Motorola CDM link radios. 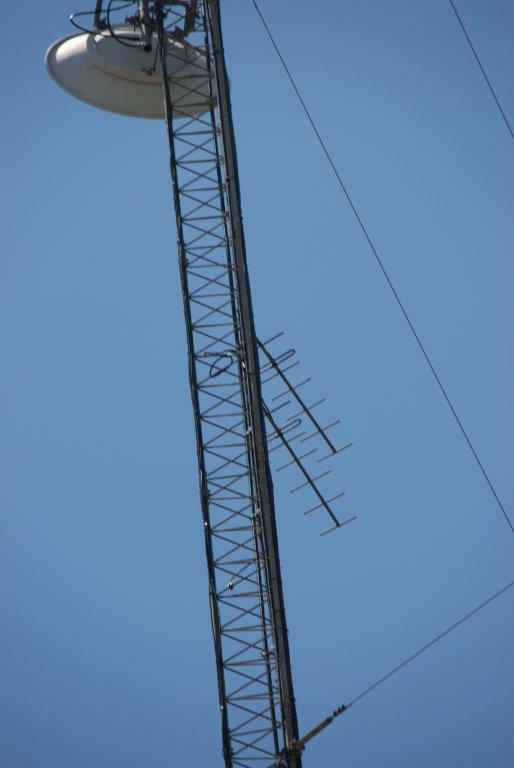 The tower shots show the dual Yagi's pointed at Pandale and our 440 vertical.